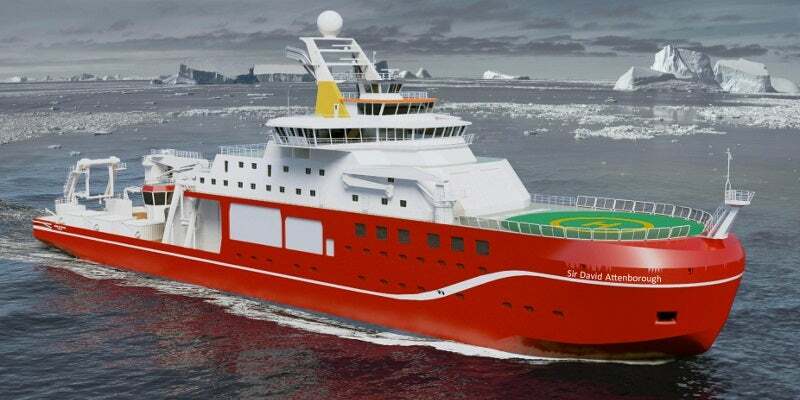 RRS Sir David Attenborough will join NERC’s fleet in 2019. Image courtesy of Natural Environment Research Council (NERC). The high-tech, remotely operated subsea vehicle named Boaty McBoatface will be deployed onboard the polar research vessel. Image courtesy of Natural Environment Research Council (NERC). The UK’s new polar research vessel is being built by Cammell Laird at its Birkenhead shipyard in Merseyside, UK. Image courtesy of British Antarctic Survey (BAS). The Royal Research Ship (RRS) Sir David Attenborough is a polar research vessel being constructed by Cammell Laird at its Birkenhead shipyard in Merseyside, UK, for Natural Environment Research Council (NERC). NERC’s British Antarctic Survey (BAS) will operate the vessel. The project was announced in April 2014, the construction started with the keel laying ceremony held in October 2016, and the vessel is anticipated to start operations in the third quarter of 2019. The project is estimated to require an investment of approximately £200m ($260m). It forms part of a larger capital investment of £6.9bn earmarked by the UK Government for science, for a period up to 2021. The construction phase of the polar research vessel is expected to generate approximately 400 jobs and 60 apprenticeships. RRS Sir David Attenborough will carry Lloyd’s Register’s class notations, including +100A1, Polar Research Vessel +LMC, CAC1, LFPL, UMS, DP (AA), IBS, NAV1, PSMR*, ECO (BWT, GW, OW, P, NOx, SOx, IHM, R), Helicopter Landing Area, PC4, Winterisation D (-40), H (-40), S(C), and IWS. The vessel will have an overall length of 128m, a breath of 24m and a draft of 7m, and will weigh 15,000t. It will be capable of accommodating 30 crew members, including 60 scientists and technical support staff. Designed to operate in the Antarctica and the Arctic waters, the vessel will be capable of enduring up to 60 days in sea-ice. In addition to serving as a research vessel, it will also supply the five UK research stations in the Antarctic, operated by NERC’s British Antarctic Survey, with cargo and research equipment. Approximately 900m³ of space will be reserved for carrying scientific cargo onboard the vessel. The vessel will incorporate a customised moon-pool open to both the deck level and at the hull, for easy deployment of airborne robots, onboard environmental monitoring systems, and robotic submarines and marine gliders. The vessel will be equipped with state-of-the-art research equipment for subsea, seismic and acoustic surveys, including an acoustic Doppler current profiler (ADCP), a sub-bottom profiler, a scientific echo sounder, a biological multi-frequency and multi-beam echo sounder, a biological multi-beam sonar, an omnidirectional sonar, an ultra-short baseline (USBL) system, positioning and telemetry equipment, net monitoring equipment, and a meteorological weather station. It is claimed to become the UK’s first polar research vessel to incorporate a helideck and hangar, which will be capable of accommodating two small helicopters. Other facilities onboard the vessel will include scientific winches, containerised laboratories and scientific spaces, as well as other public spaces, including accommodation rooms, a general mess hall, a galley, a bar / lounge, a conference room / library, a sauna, a fitness centre, laundries, and a hospital. It will also be equipped with tanks for storing potable water, aviation fuel, and diesel. The vessel’s diesel-electric propulsion machinery is to be supplied by Rolls-Royce. The vessel will be powered by the new Bergen B33:45 engines integrating two nine-cylinder engines and two six-cylinder engines. The engines will drive two Rolls-Royce 4.5m diameter controllable pitch propellers (CPP), which will enable the vessel to sail at a service speed of 13k and break through ice up to 1m-thick, while sailing at a speed of 3k. In addition to the propulsion machinery, Rolls-Royce will also supply the automation and control systems, dynamic positioning system and its proprietary Unified Bridge, as well as the deck handling systems. The initial concept design for the vessel was provided by Houlder, who has been retained to further serve as the technical adviser for the project.